A very successful effort for this vintage in the Medoc, this deep ruby/purple-colored Pauillac exhibits class/nobility/breed along with black currant liqueur, licorice, and incense notes. Sweet, expansive, fleshy, and medium to full-bodied, with good structure, ripe tannin, and a long, 30-35 second finish, it can be drunk now, but will be even better in 2-3 years; it will last for 12-15 years. I had this wine three separate times out of bottle, and it is performing significantly better than it did from cask. Drink: 2004 - 2019. Tasted blind at Bordeaux Index’s 10-Year On horizontal. This has a relatively light but feminine bouquet, earthy notes at first, later tightly coiled blackberry and cedar, briary and pencil box. The palate is medium-bodied with a succulent entry that marries beautifully with the fine tannins and depth of flavour. This is more primal than its peers, but wonderful delineation and purity with a caressing, silky smooth finish. 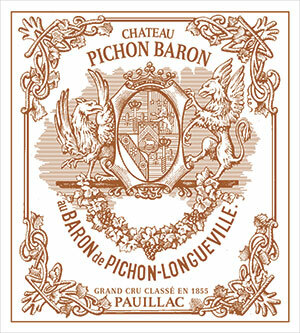 Utterly seductive: this Pichon Baron is finally coming into its own. Tasted March 2011.